This tech ETF beats the other players in the sector when it comes to costs and portfolio construction. Is this the best ETF for 2017? The tech sector is home to many of the most dynamic and innovative growth companies of our times, and this means exceptional opportunities for profitability when you invest in the right tech names. On the other hand, the sector is always changing and remarkably competitive; the winner of today can easily turn out to be the loser of tomorrow, so many investors tend to stay away from individual tech stocks because of risk concerns. Interestingly, exchange-traded funds -- ETFs -- can be a smart approach to investing in the tech industry while diversifying company-specific risk away. Vanguard Information Technology (NYSEMKT:VGT), Technology SPDR (NYSEMKT:XLK), and iShares Dow Jones US Technology (NYSEMKT:IYW) are three of the most popular ETFs to invest in the tech sector, so let's take a look at which one is the best choice for investors. 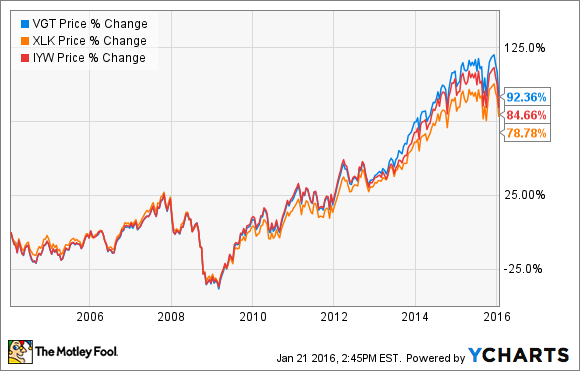 The three ETFs have fairly similar portfolios, and performance has not been very different over the long term. This means costs can play a big role in the decision, and Vanguard is well-known for its strict focus on keeping expenses as low as possible. ETFs and mutual funds from Vanguard typically offer competitively low expense ratios, and technology ETFs are no exception to the rule. Vanguard Information Technology has an expense ratio of 0.1% annually, which is 93% lower than the average expense ratio of funds with similar holdings, according to Vanguard. Technology SPDR carries an annual expense ratio of 0.14%, still quite reasonable in comparison to other technology ETFs, but it comes clearly behind the Vanguard ETF. iShares Dow Jones US Technology is materially more expensive than the other two alternatives, with an annual expense ratio of 0.43%. Unsurprisingly, Vanguard is clearly ahead of the competition when it comes to costs. There are some slight differences in portfolio construction for the three ETFs. Technology SPDR includes telecom companies in the portfolio, and AT&T (NYSE:T) accounts for a big 5.5% of assets. Telecom companies are fairly different to most companies in the technology business, so this deserves some deeper analysis. Companies such as AT&T operate in a mature and saturated industry. Competition is quite intense, and pricing pressure is hurting profit margins while limiting opportunities for growth. In this context, AT&T is betting on acquisitions such as the recent purchase of DirecTV to jump-start growth, since the telecom industry is no fertile ground for expansion. None of these means AT&T is necessarily a bad investment; the company's difficulties are already incorporated into valuation to a good degree, and A&T stock is paying a big dividend yield of 5.6% at current prices. However, this is not what you generally look for in a tech ETF. Investors hunting for the best technology ETF probably want companies with big growth potential and superior profitability, even if this means paying above-average valuation levels. AT&T does not fit into this description very well, so including it in the portfolio looks like a drawback when it comes to Technology SPDR. Another relevant difference is that Vanguard Information Technology includes companies such as Visa (NYSE:V), which is considered to be an IT services stock. Visa accounts for 3.4% of assets in the Vanguard ETF, but is excluded from both Technology SPDR and iShares Dow Jones US Technology. Visa's competitive strengths come from multiple sources, and technology is as important as scale and brand recognition when it comes to understanding the company's business model. Besides, financial performance has been quite outstanding over the long term: Visa has delivered a compounded annual growth rate in revenue of almost 18% annually through the 10-year period ended in September of 2015. Growth is understandably slowing down as the company gains size over time, but Visa still reported a huge operating profit margin in the neighborhood of 80% of revenue last quarter. When considering both the business model and financial performance, Visa offers many of the strengths you typically find in the best tech companies, so the fact that Visa is included in Vanguard Information Technology is a plus for the ETF. To wrap up, Vanguard Information Technology offers lower expenses than both Technology SPDR and iShares Dow Jones US Technology. The Vanguard vehicle also includes IT services companies such as Visa, while excluding telecom operators like AT&T, and this makes it more representative of the typical traits we appreciate when investing in the tech business. For these reasons, Vanguard Information Technology looks like the best ETF to invest in technology.